Readers, hear me out. The last thing I want to do, in the midst of a “fun” bracket, is stir your blood to mutiny. I’m here to advance Psycho T to the next round, not to praise him. The editors have made Tyler Hansbrough a 1-seed in the ’00s region, and the editors are all wise, honorable people. The hatred that college players inspire lives after their NCAA careers end, while the good is often hung in the rafters with their jerseys. So let it be with Psycho T. The Grantland editors have told you that he was a hated player. If that’s true, it was a grievous fault, and as a top seed, he has grievously answered it. What private griefs the editors have, I don’t know. But, they are wise and honorable, and will, no doubt, with reasons answer you. I come not, friends, to steal away your hearts. I’m no great orator. 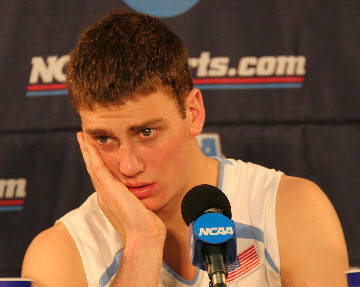 I’m the same as you’ve always known me: A plain, blunt man who loves Tyler Hansbrough. If I were disposed to sway your minds to rage, I would do the editors wrong. Yet bear with me, because my heart is there in the bracket, with no. 50. I must pause until it comes back to me. I can only tell you what you already know. I can only show you Psycho T’s attributes, and let them speak for me. For there are not many who agree with my love for Hansbrough. When I checked the Facebook polls before they closed Tuesday evening, he was throttling Marcus Williams, 4,512 to 922. I’m no Nate Silver, but I think it’s OK that I projected a victory. (Just to be safe, nobody show this to Karl Rove.) And let’s face it, Williams never had a chance. Putting him up against Psycho T in a “Most Hated College Basketball Player” bracket is like putting me up against Benedict Cumberbatch in a “Which Name is More British?” bracket. The winner was never in question. He had a vacant face, wide, puzzled eyes, and a mouth that was perpetually ajar. If you saw him on the street, you’d give him a quarter for a lollipop. Also, his head was sort of oblong. Maybe this is enough to hate a person. Maybe the rage his appearance stokes in others reveals something about his character. Is a childlike look of innocence to be despised? Should we give in to our base instincts and trust our fury? He represents the adolescent dork in all of us, but the editors say he’s hated, and the editors are all wise, honorable people. Beyond his looks, you have to contend with his style. He’s a “goofy dude” to the extreme, but what made him super-frustrating as a goofy dude was that he’d harnessed his gangly movements and turned himself into a maddeningly effective basketball player. He was always striking poses like this one or this one or this one or this one, and then somehow making shots. I like to think he was a pioneer of the successful goofy dude style, just a few years ahead of the Zeller brothers. He’s a hero to young goofballs everywhere, a sign that the youth can transcend their limitations and somehow be efficient, despite having feet the size of pontoon boats. Is that inspiration to be hated? The idea that we’re not limited by our earthly forms, and that there’s hope for even the gawkiest youths? Shouldn’t our hatred be reserved for sterner crimes? But the editors say he was hated, and the editors are all honorable people. Was it his hilarious celebrations? The brilliant physical comedy? Was it the rarity of his raw emotion? Was it the assaults he endured from those he defeated over and over (never having lost in four years at Cameron Indoor Stadium)? Was it that he jumped off a roof into a pool? Was it that he averaged almost 20 points per game and finished his career as the ACC’s leading scorer and the most made foul shots in NCAA history? Was it the moments when he revealed his goofiness to us in a way most athletes wouldn’t dare, as in this, the most awkward minute in YouTube history? ARE THESE THE REASONS WE MUST HATE HIM? Look again at that bracket. That 1-seed. Look how the reputation of the man diminishes with every round he advances. Psycho T’s openness, as you know, made him an angel to writers and editors everywhere. In an age when our heroes are trained to close themselves off, he was too unique to hide. He gave us so much, and asked for nothing in return. And when the editors put him in that bracket as the most hated man of the aughts, we all went in that bracket as hated men — I, and you, and all goofy Americans — while bloody treason flourished over us. There he is, marred with traitors. If I were an editor, and not a plainspoken man, I would ruffle up your spirits and put a tongue in the mouth of every Facebook commenter that would move the Grantland readers to RISE and MUTINY!